People need to know that when a family losses one of their children, it doesn't matter that the child was not 'born' it is still their baby. And is absolutely worthy of mourning. People need to realize that four months may not be enough time to, 'get over it'. If I tell you something wasn't a priority just two months after my son died, it means just that, and it is the reason it wasn't taken care of. And it is a valid reason. People need to realize that we may still cry, a lot. People need to realize that anger is a normal response to a loss, and sometimes that anger may be directed at you...don't take it personally. People need to realize that unless I ask for it, I really don't want your advice on how to cope with my loss. People need to realize that stillbirth is the death of a person's child, their baby, their hopes and dreams. Stillbirth hurts too. Our babies lived, it may have been in the womb only, but they had a beating heart, toes and eyes. They were human babies, not just blobs of tissue or the by products of conception. but he did have eyes, and a nose, 10 perfect toes and ears. Everything a baby has. He was real. Not just to me, but to my family, to my mom, to those that care about me. Don't make me feel like my baby wasn't good enough to have a funeral, or a wake. Don't give me the attitude that I made the wrong choices in choosing to honor him just as I would honor any of my other children. He is my baby. My saint in Heaven. My dove. My Colm. 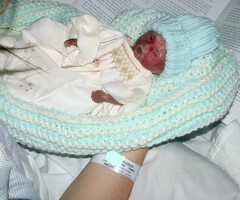 If you have never seen a picture of a stillborn baby, it can be a little difficult to see. Personally, I prefer his 'natural; ;look, but I understand that not everyone can see the beauty in my baby the way that I do. He is beautiful, and very real!! Though I am sure it was not easy with the flood of emotions at the time, I am sure you are thankful to have taken pictures. I think about you often and keep you in my prayers. It has been three years since I my son died. And I think it is so important to continue talking about him as you do about your baby Colm. He is a part of the family. Thank you for sharing your experiences. Blessings on your journey . . .